Age Hareide hopes the experience of playing in last season's Champions League play-off round will help his Malmo team beat Celtic on Tuesday. A year ago, the Swedes beat Salzburg to reach the group stages but trail Celtic 3-2 from the Glasgow first leg. "It was more important last year, both financially and football-wise," said the coach. "We had to sort of do something we hadn't done before. "Now we've done it and I think the boys are more relaxed than last year." Malmo trailed the Austrians 2-1 from the first leg last August, but a 3-0 win in Sweden ensured they progressed. Now Hareide's team have to produce a win at the Swedbank Stadion and limit Celtic's away goals tally to reach the group stages. The Norwegian believes compatriot Ronny Deila's team will be difficult to break down. At Malmo's news conference on Monday, he said: "I have seen Celtic play Qarabag away from home. They did that in a great manner. "They defended well when needed; they had a one-goal lead in that game as well. "They are capable of defending and they have good physique in that part of the team. That makes it difficult. "I think they are more of an international side than Salzburg and they know what to do at an away ground." 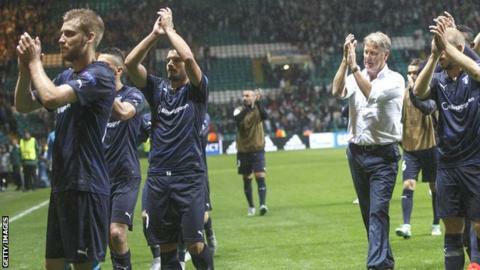 However, Hareide is encouraged by his side's comeback at Celtic Park. "A new team could have broken down completely after that shock opening from Celtic, being down 2-0 after 10 minutes," he said. "It shows morale and guts in the side. At the end, 3-2 was a good result for us. "We now know more about how to play Celtic. Our side is more suited to attack. At home, we have done that perfectly before, so why not again?" Hareide predicts Malmo's home ground will provide his team with an advantage on Tuesday evening, saying its tight, 20,000 capacity "gives the players energy". Asked about the reported comments made by Johan Wiland - the Malmo goalkeeper is said to to have compared Celtic players to "pigs" - the team boss said: "If you are going to write about players, you have to know the words...the translation. "I would call it (the first leg) a tough game but not a dirty game. "You have to know the pronunciation because 'a pig' is something else in English than it is in Scandinavia. "You have to have respect for other languages. "That is why I am upset at the press because you just translate things, put things in headlines and then you get something out of it. We hadn't said it."